This pub is an oasis for beer, with up to eight guest ales on at any one time. The pub itself is pretty innocuous and plain, though the inside has been done out with memorabilia from India with heavy carpets and wood panelling. A large fireplace warms in winter and there is an extensive beer garden for summer with seating. The bar is 'L' shaped leading towards the back of the pub and the pool/darts room near the basic toilets. There is also an eating area which doubles up as a small 'hall' for the annual beer festival - usually 80 beers on during the festival. In the present family's hands for 150 years, there is a loyal following of ale fans who make annual and regular trips on the train from Shrewsbury and Crewe (but from further afield as well). The train station is Wrenbury about half a mile away (Paradise Brewery has a tap on the way). Food is top quality with extensive menu items and a special menu for vegetarians. Prices range from �8-�14, but the food is well cooked and presented and the staff are pleasant and helpful. Credit cards are taken here. Meals can be complimented by a good range of wines and bottled foreign beers. Access for the disabled is via the back entrance, though the toilets can be difficult to negotiate. There is a no smoking area in the bar. 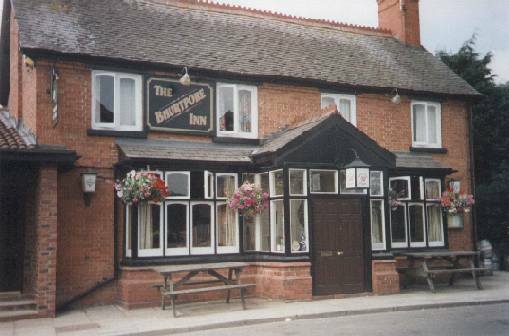 The Bhurtpore Inn is a very pleasant place to visit and you wont want to leave. No loud music. No accommodation here but you can camp if you like. At least six to eight guest ales.